ARLINGTON, Texas - If the Red Sox can’t figure out a way to beat the Rangers, their punishment is likely to be a playoff series against them. Texas would certainly welcome that. The defending American League champions continued to bully the Sox last night with a 4-0 victory before 33,920 at Rangers Ballpark. The Sox are winless in four games against Texas this season, getting outscored, 30-11. Going back to the start of the 2009 season, they are 6-17 against Texas with losses in 10 of the last 12 games. Last night’s setback dropped the Sox a full game behind the Yankees in the American League East. With Texas leading the West, the wild-card team could well be here Sept. 30 for the Division Series. Given the teams’ recent history, the Rangers might roll out a red carpet for the Sox at the airport. The Sox have dropped five straight games here and 11 of the last 13. Sox manager Terry Francona said he hadn’t considered the team’s record against Texas, pointing out that his club is better now than it was at the beginning of the season. But the dour mood that permeated the clubhouse suggested the Sox had grown tired of being knocked around by Texas. Even Dustin Pedroia was sullen. C.J. Wilson (13-5) and three relievers held the Sox to four hits, all singles. With Jacoby Ellsbury and David Ortiz still out, a yard sale lineup that was sufficient against Kansas City looked overmatched in the 102-degree heat. The Sox advanced only one runner as far as third base as they were shut out for the ninth time this season. Wilson allowed four hits, walked two, and struck out four in 6 2/3 innings. He and Tampa Bay’s David Price are the only pitchers with four victories against the Sox since the start of last season. Wilson left two runners stranded in the first inning, getting Jed Lowrie to ground into a force play with two outs. The Sox didn’t threaten again until the seventh when Lowrie singled and rookie Ryan Lavarnway drew a walk. With Wilson at 110 pitches, Texas manager Ron Washington went to Koji Uehara with two outs and he got Jarrod Saltalamacchia to ground to second. Erik Bedard kept the Sox in the game for five innings before one pitch let it slip away. The Rangers took a 1-0 lead in the third inning, scoring a run they didn’t deserve. Bedard walked No. 9 hitter Craig Gentry with one out, throwing two strikes before missing on the next four. Kinsler followed with a soft liner to shallow right field. Josh Reddick broke in and made a diving catch, catching Gentry off first for what appeared to be a double play. But first base umpire Doug Eddings ruled that Reddick trapped the ball. Replays showed clearly that the catch was made. Reddick said he was “100 percent sure’’ he caught the ball. The blown call proved important as Elvis Andrus singled through the shortstop hole, scoring Gentry. 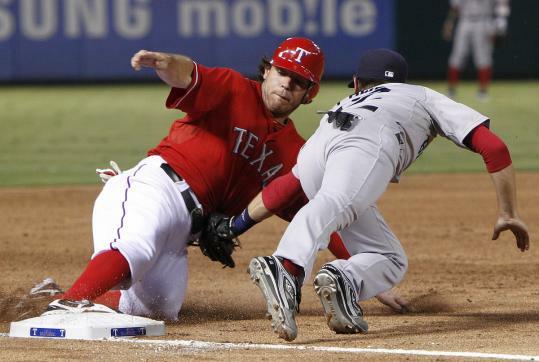 It was still 1-0 when Josh Hamilton and Michael Young had singles in the sixth inning. Bedard stuck out Nelson Cruz with a curveball for the second out. His two-strike pitch to Mike Napoli was a fastball up and in, right where he wanted it, but the Texas DH managed to keep his hands in and drive the ball just over the scoreboard in left field for his 21st home run. The television cameras caught Bedard saying “Wow’’ as the ball cleared the fence. “That was a hard pitch to hit,’’ Saltalamacchia said. Bedard went six innings, allowing four runs on seven hits with one walk and four strikeouts. He is 0-2 in four starts for the Sox since being acquired from Seattle July 31. Until Napoli’s homer, last night was Bedard’s best outing, especially given the competition. “Just made one mistake and [Napoli] hit the ball out of the ballpark,’’ he said. The teams have six more games remaining this season, three in this series. John Lackey faces Colby Lewis tonight.